On May 25, 2004 Beliefnet, the spiritual gurus of the Internet, announced the launching of Soulmatch. That's why they've created Soulmatch, a dating site focusing on values, spirituality, character and beliefs. 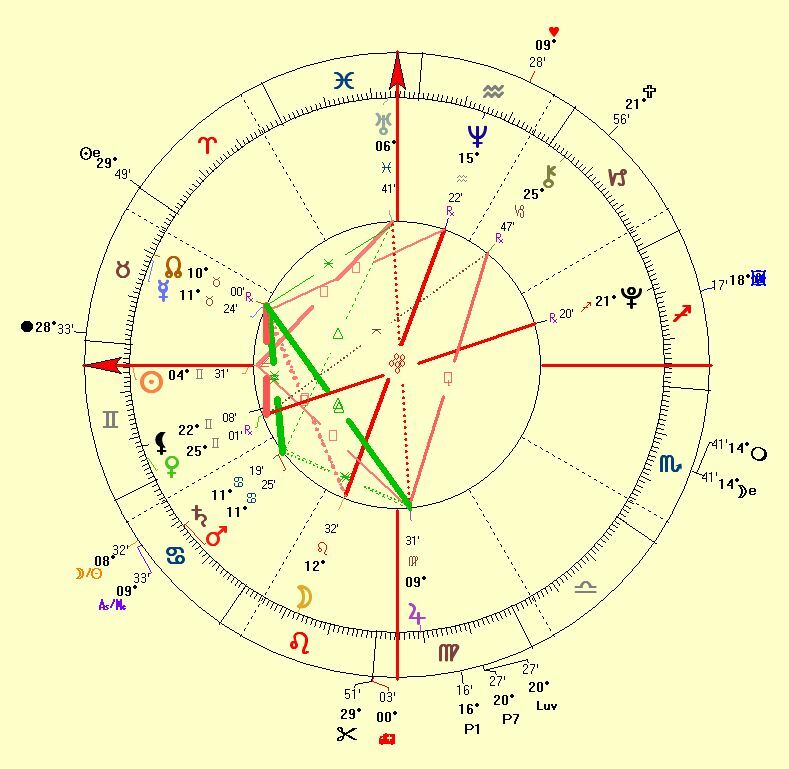 The chart shows a beautiful Mercury/Moon's North Node-Jupiter trine denoting philosophical thinking, spiritual beliefs and wisdom. No wonder that their belief system is part of their mission! There is a small triangle in this announcement chart (Mercury/North Node and Jupiter are both sextiled to the Mars/Saturn conjunction). A 'small triangle' is a planetary configuration that signifies sociability (because of the two sextiles) and is often called 'the endowment triangle'. Soulmatch is endowed with knowledge and wisdom. For a dating service, this is a very favorable configuration. The Mars/Saturn conjunction can bring some self-interest to the foreground, however. Fortunately the Mars/Saturn conjunction is outgoing (it's a waxing phase), Mars is running away from Saturn which is more favorable than the incoming (blocking) conjunction. Initiating Mars now receives support from Saturn (big organizations and Institutions). Around 2006 progressed Sun will square Uranus in the announcement chart. Some years later progressed Sun will square Jupiter. Between these dates this progressed Sun will be at the apex of a T-square in which Jupiter opposes Uranus. Fortunately the Jupiter/Uranus opposition is released by the trine with the Mercury/Moon's Node conjunction. The configuration that the progressed Sun starts building from 2006 on is called a "crystal" (Jupiter and Uranus are opposite one another, both planets are sextile to respectively Mercury/Moon's Node and Mars/Saturn and both planets are square the progressive Sun). This configuration indicates cohesion, stability, responsability but can also indicate a tendency to rate oneself too highly. Soulmatch will be able to fill a gap in the Online Dating Industry by bringing harmony and balance based on their values and belief-system. The crystal configuration is a conflict-healer. We may expect that the number of members of Soulmatch will sky-rocket within the next years.